It’s February and love is in the air – but that’s nothing unusual here at Coco Plum Island Resort where we celebrate love all year long! As a secluded, private island with only 14 oceanfront cabanas, Coco Plum provides all the privacy, breathtaking scenery, and spectacular service that any couple in love might desire. 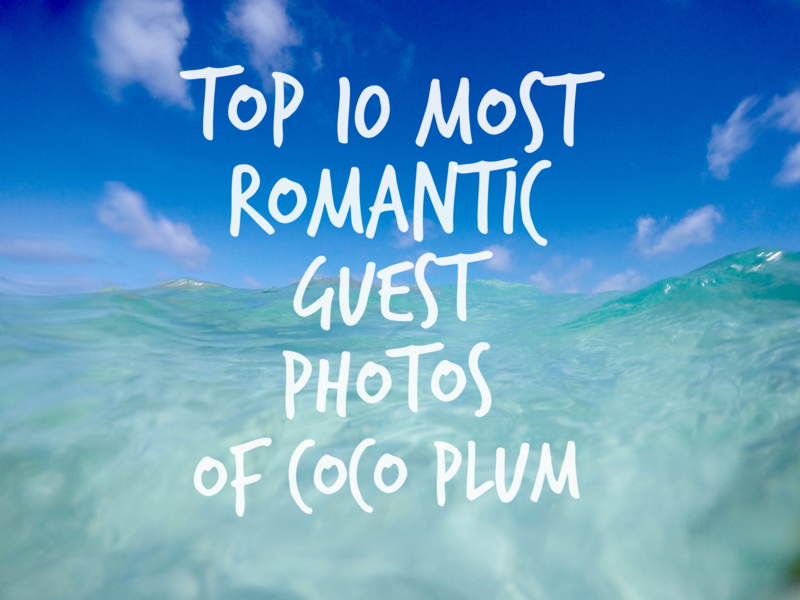 And undoubtedly, many of our previous guests have shared raving reviews and photos of their time with us at Coco Plum so much so that Coco Plum was named the #1 Hotel in Belize and Central America for Romance! With some many wonderful guests photos, its hard to narrow down the top ten, but we tried! So, see for yourself from our guests’ perspective, what Coco Plum is all about. 10. Mr. & Mrs. – it’s official! After the wedding celebration, come sit-back, relax, and enjoy quality time with the love of your life on your private island honeymoon. 9. And the adventure begins! The calm, crystal-clear waters of the Caribbean Sea make for the perfect swimming grounds to kayak and paddle board around the island. All water sports equipment are complimentary for guests. 8. From the sea to the jungle … What better way to start off your honeymoon than with an excursion to the Xunantunich Maya Ruin in Belize? The moderate hike is well worth it when you get to the top & can enjoy the expansive view with your honey. 7. At Coco Plum there is absolutely nothing wrong with doing nothing at all! 6. Happy wife, happy life. Whose with us? 5. Grab a beer, a fishing rod, and enjoy the sunset over the horizon. This is THE life. 4. Enjoy a romantic dinner on the docks of Coco Plum. Feel the Caribbean sea breeze, hear the sound of the waves lapping against the shore, look up to see the stars & moonlight, and devour our tropical cuisine. 3. Waking up to this view every.single.morning. 2. Island hopping to nearby Belize cayes is an unforgettable journey. Hobie-cat guides are also available. Keep sharing your Coco Plum guest photos on Instagram with the hashtag #cocoplumislandresort. Whether you simply want to get away with your loved one or are celebrating a special occasion such as a honeymoon, baby-moon, anniversary, or birthday, Coco Plum provides the ultimate private island escape. Our all inclusive honeymoon/lover’s getaway package includes oceanfront accommodations, meals, a complimentary bottle of wine, unlimited local drinks, and a romantic candlelight dinner on the over-the-water docks. Recently engaged and considering a destination wedding? Contact us today for more information.